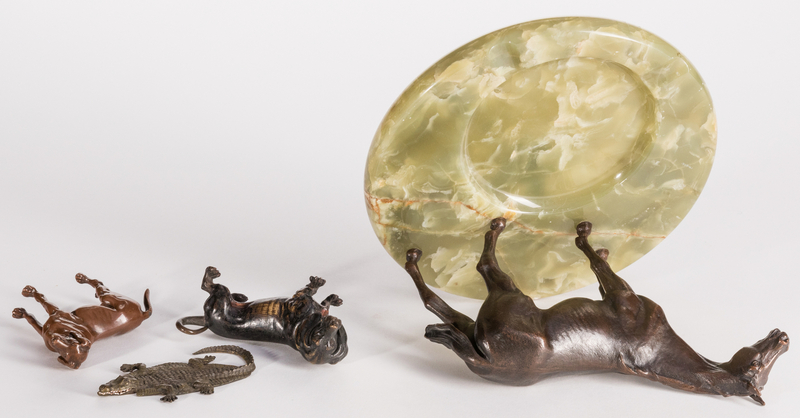 Four (4) bronze animal figures. 1st item: After Jennings Brothers (American, fl. 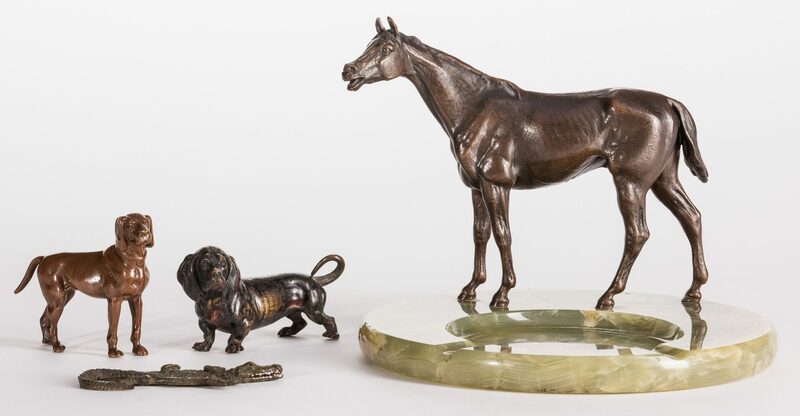 1890-c. 1950) bronze horse figure mounted to circular green onyx ash tray with carved recesses. 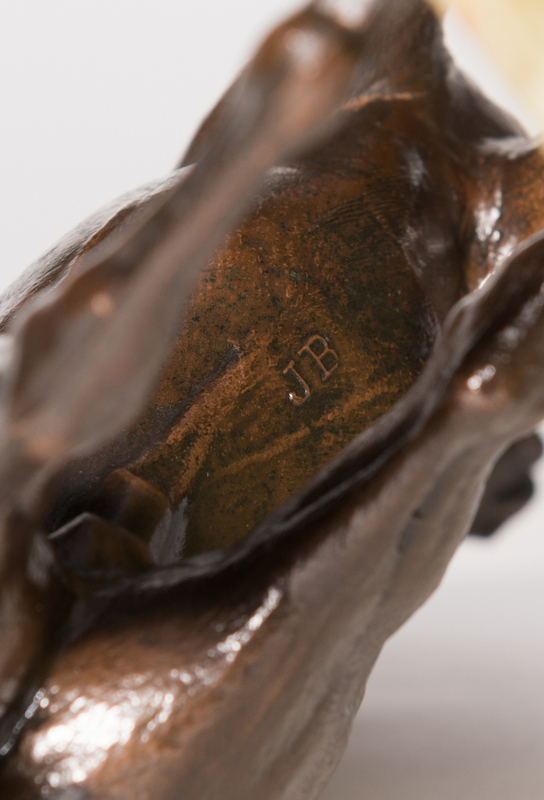 Embossed J B, underside of horse. 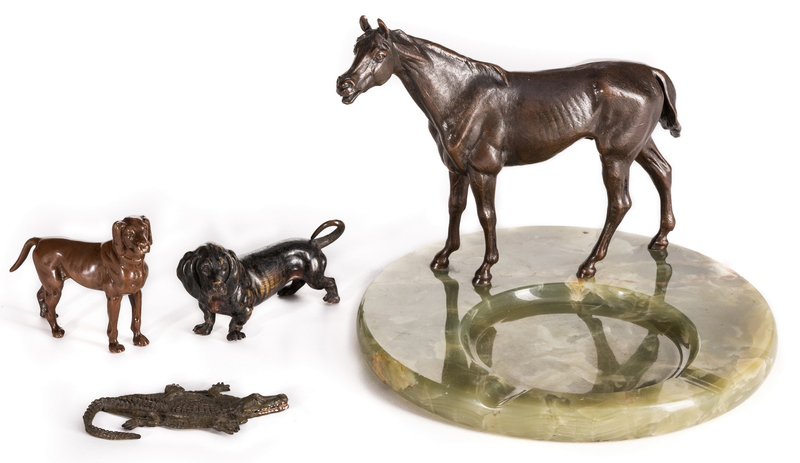 Horse – 7" H x 9" W x 2" D. Tray – 1" H x 9 3/4" dia. Late 19th/mid 20th century. 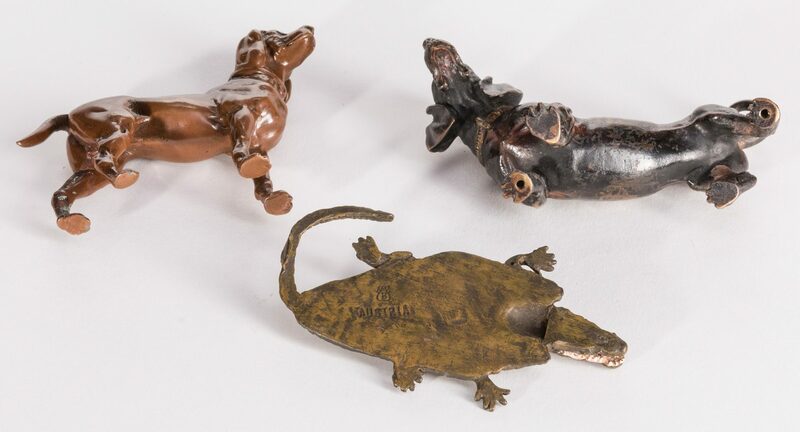 2nd item: After Franz Xavier Bergmann (Austrian/American, 1861-1936) bronze flattened alligator figure, cold painted inside of mouth. Stamped AUSTRIA with an urn insignia and B within, underside of alligator. 1/2" H x 4 1/2" W x 2 1/2" D. Late 19th/early 20th century. 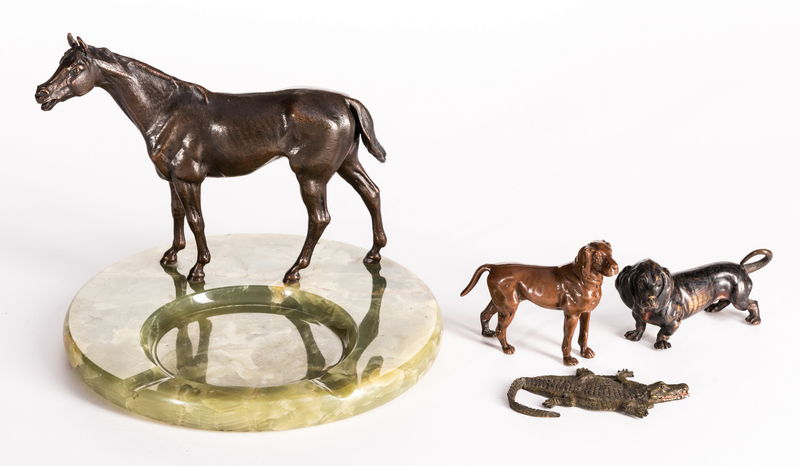 3rd-4th items: Two cold painted bronze figures of dogs, one of a basset hound, one of an English Pointer or Setter. Unmarked. 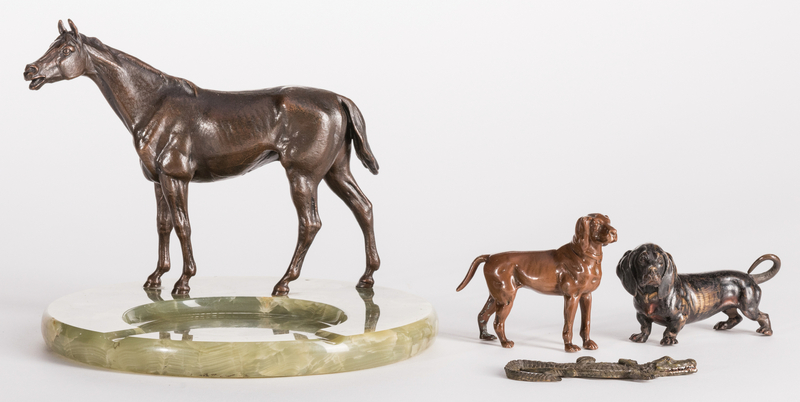 Basset Hound – 2 5/8" H x 5" W x 2 1/4" D. Pointer/Setter – 3 3/8" H x 4 1/4" W x 1 1/4" D. Possibly American, early/mid 20th century. CONDITION: 1st item: Overall excellent condition. Fleabites to surface of onyx tray. 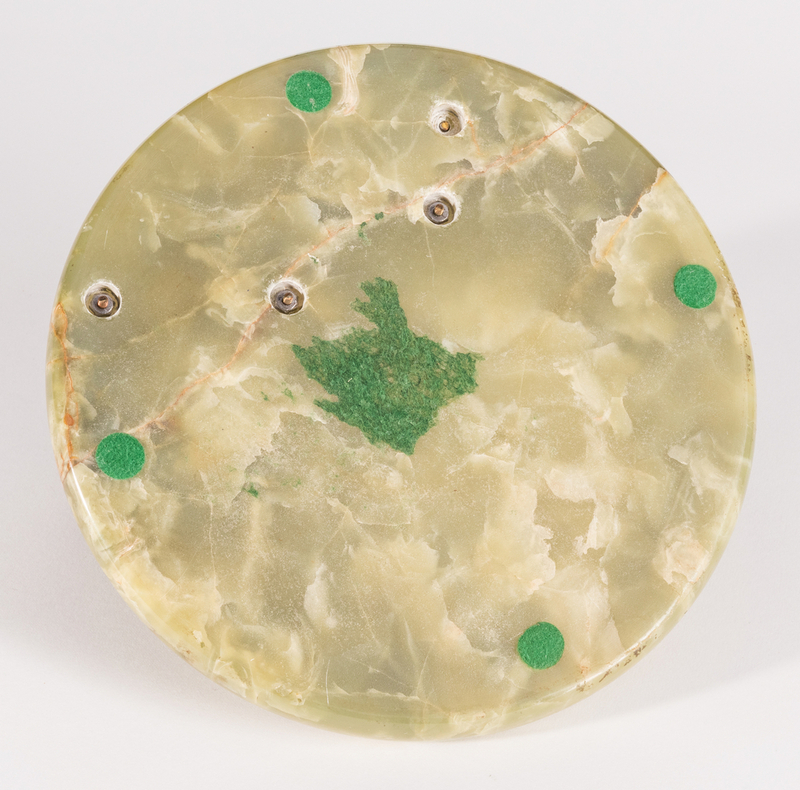 Scratches, traces of green felt, underside of tray. 2nd item: Overall very good condition. Minute losses, wear to cold paint. 3rd-4th item: Overall good condition. Wear to patina, body and underside of basset hound. 1/8" area of loss to patina, tail of pointer/setter. 1" area of oxidation, back left leg of pointer/setter.